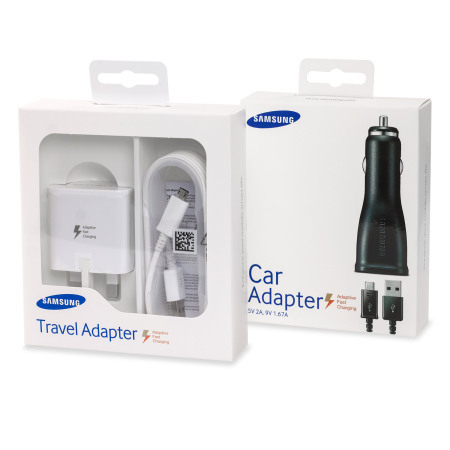 Featuring the genuine Samsung Adaptive Fast Mains Charger and genuine Samsung Adaptive Fast Car Charger, this pack is perfect for fast charging your Galaxy S6, S6 Edge, S6 Edge +, Note 5 and Note 4. I bought this so that I have a second charger for my Samsung Note 5 to place on my desk or take on trips. It works superbly and is meets my requirements and expectations excellently. I managed to buy a genuine Samsung fast cat charger, mains charger and spare cable for a better price than I could find anywhere else. Regular order updates were provided and fast delivery. Very pleased! As expected original branded products all in their original packaging. After a courier error i finally received my order. A great deal, a good price. Liking the extra charger so if battery a little low i can plug in the charger at home. Also if in the car on along joinery with Google maps and music playing the quick charge 2.0 on both home and car charger will give fast charging the way it is ment to be (9V 1.5/1.6 Amps). Very happy clever Samsung! P as all from this trusted site. The charger works very well and charges my phone extraordinarely fast. It's a well built product and is definately worth the money.